Have you ever heard "Yea Alabama!" done by a Mariachi band? Me either! 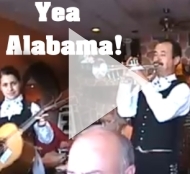 Check out this very unique version of the Alabama Crimson Tide fight song! I LOVE IT!